Autumn is nearly over. Things change – weather, mood, trends. 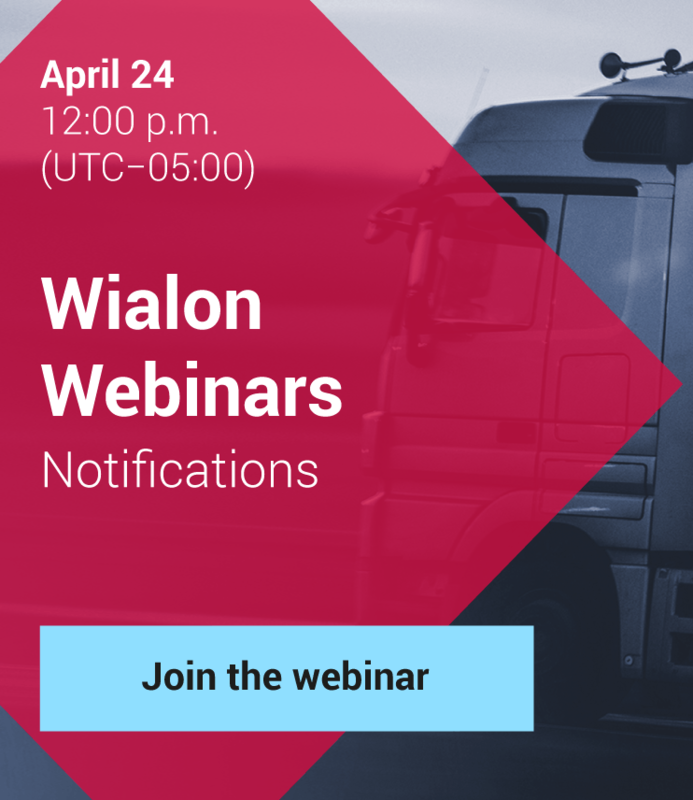 But one thing remains unchanged – Wialon Hosting monthly update. Despite autumn melancholy, Gurtam team continues working for the community to be pleased with the advancements in system functions and design. Gurtam team is excited to watch partners achieve success by continuously adding connections to their Wialon accounts. With that there are also more demanding requirements for the tracking system. We are grateful to you for sound ideas, coming in from our forum. Your suggestions allowed us to implement some very interesting advancements in the latest 1611 update. The name for each field is preset – all that is left to do is to specify value. 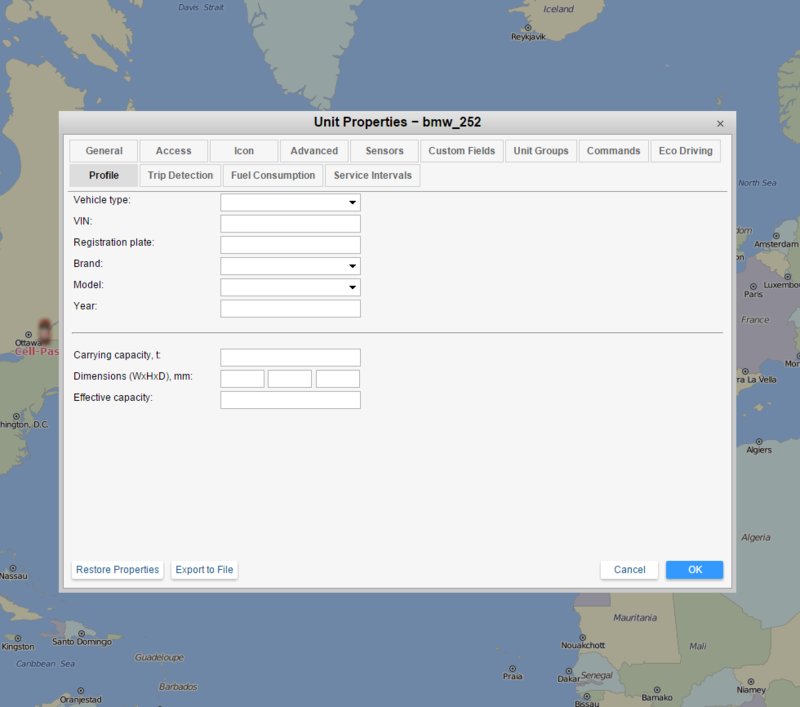 After the fields are completed new information is available in user settings, export/import and report templates. Although the predetermined values are not provided, the system “remembers” up to 15 most recent text items entered into the system for other units. Thus, as you use this functionality Wialon system will automatically offer you relevant options to fill in the appropriate fields, except for “VIN” and “Registration plate”. It should be mentioned that for “Carrying capacity”, “Year” and “Dimensions” fields only numeric values are available. The information also becomes available in unit’s tooltip or in the work list. Just choose the data visualization options in User Settings by flagging one of the Profile options under “Show Additional Information about the Unit”. Remember to assign access rights “View detailed item properties” and “Edit not mentioned properties” to start working with Profile tab. Once again our partners inspired us to further improve report templates we now expanded grouping options. 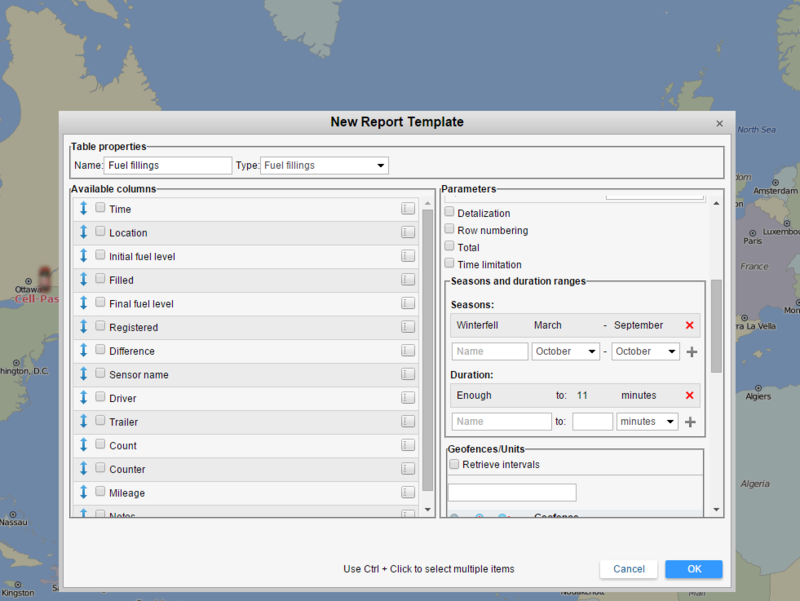 After adding table in report template dialog you now have an option to group data by seasons and trip durations. For data grouping by seasons “Name” field is custom. This means you can set any season name according to your needs and choose its duration using dropdown lists. The system is not confined to the four typical seasons. If March through August the unit operates in winter conditions, just set the corresponding season in the lower-right section of table parameters. Grouping by trip duration option is just the same. Try it by setting interval name, limit (seconds, minutes, hours and days) and, if necessary, start creating new interval by clicking “+”. What’s more, from now you can choose any criterion from “Total” dropdown list without setting the corresponding flag. Grouping is performed by any columns available for the table type. 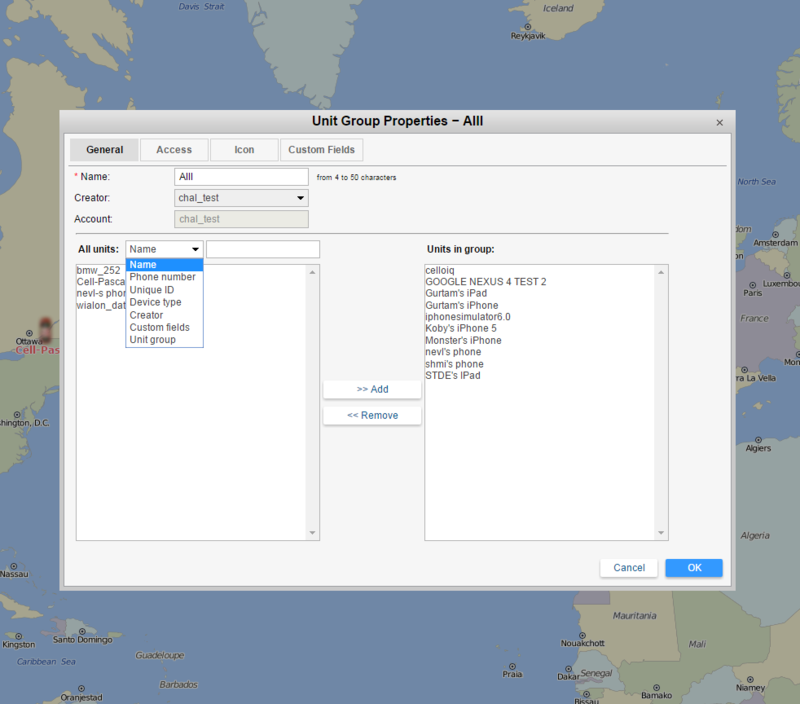 We also extended unit search filter in unit groups, export/import and retranslators dialogs. Telephone number and Unique ID are now available as search criteria in the dropdown list, allowing you to filter units by the core properties for unit identification in the system. We make every effort for our platform to be both functional and user-friendly. That’s the reason why Gurtam continuously updates system design. Our team is sure that the updated design of familiar interface will help you take a fresh look at Wialon system. This time our designers updated dialog buttons stylization and developed a new set of icons for the monitoring panel. Moreover, with due account for Wialon GIS color layout we changed default line color in the routing tool. We made it pink for you to distinguish the line, no matter which map layer you are using. 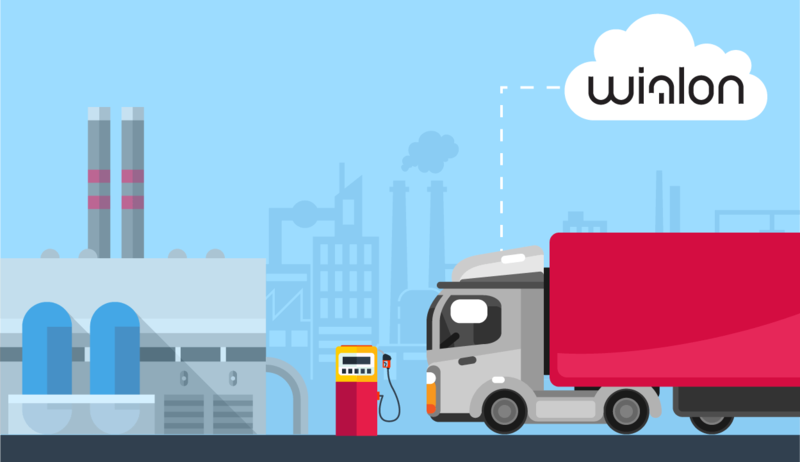 As of this writing Gurtam team is working on new Wialon Hosting updates to ensure you have access to the most advanced fleet management functionality on the market.